NEW YORK - Jan. 22, 2019 - PRLog -- On February 18 and 19, The Tank, an Off-Off Broadway theatre in New York City, will feature a limited engagement run of a very unique show, IWATTAU. IWATTAU is a part of a project created by Film Lab President, actor Jennifer Betit Yen, to address xenophobia and create non-polarized dialogue through the arts. Through the project, Film Lab collected a multitude of stories and opinions on the topic of immigration in both written and video form from people across the country. This resulted in both a series of videos on Facebook (http://facebook.com/AAFLTV) and YouTube (http://youtube.com/asamfilmlab), as well as a written anthology (https://www.thebookpatch.com/BookStore/immigrants-we-are-them-they-are-us/7c216a4a-2d0a-48d2-b0f6-e0df0e1dcf99). Ariel Estrada, Executive Director of Leviathan Lab, an actor and the recent producer of "TheWall: Immigration in the Time of 45," offered to take the project to the stage. "It is so important to use theatre to bring people of all viewpoints together," Mr. Estrada explained. "And this was the perfect way to do it." Ms. Betit Yen and Mr. Estrada enlisted the aid of Emmy nominated writer Cheryl L. Davis and director Melissa Skirball to bring IWATTAU to life. 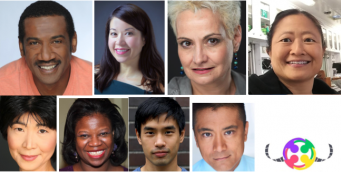 The cast includes both Broadway and TV/film actors, including Robert McKay (Ocean's 8, Hidden Figures), Jennifer Betit Yen (Search Party, Royal Pains), Ariel Estrada (Blue Bloods, Bull), Toy Lei (Boxer, Grey's Anatomy), along with Nicky Khor and Film Lab Actor Directory members Georges Bridges and Mami Kimura. Said actor Robert McKay, "This is a very important conversation about immigrants and immigration and the contributions to society as a whole." Kimura agreed, noting she signed on to the project in memory of her relatives, who came here to seek a better future for their descendants, a chance she believes everyone should have. Betit Yen noted, "This is not your typical piece; it opens up dialogue about very real fears – over population, crime, jobs – and uses art to address them in a real and multi-faceted manner." Betit Yen added that the project is "dedicated to the Native Americans, who were here first but are too often made to feel like guests in their own country." The shows will run Feb. 18-19 at The Tank and will include an interactive audience component. They will be followed by a panel moderated by CBS Interactive's Livia Areas-Holmblad and including Franck Joseph, Assistant Commissioner at The New York City Commission on Human Rights. Tickets are available on The Tank's website (https://www.thetanknyc.org/calendar/iwattau-feb-18) and at https://iwattau.brownpapertickets.com. The Film Lab is a non-profit 501(c)(3) headquartered in New York City that has been dedicated to the promotion and support of gender and ethnic diversity in media since 1998. The Film Lab accomplishes that goal in three ways: (1) education; (2) outreach and support; and (3) film, television and online entertainment production. Education – The Film Lab runs monthly events that are open to the public ranging from screenings to seminars to Q&As, all designed to increase awareness of the current state of diversity in media and to provide audiences with the tools and motivation to effectuate positive social change through entertainment. Outreach-Support – The Film Lab runs various programs ranging from the famous 72 Hour Shootout filmmaking competition to filmmaking how-to workshops to networking parties, all of which work to connect people of color, particularly Asian Americans, and mainstream media executives and to create mentorship and distribution opportunities for people creating diverse works. The 72 Hour Shootout filmmaking competition is arguably the Film Lab's most important annual event; bringing together A-list judges and established and aspiring filmmakers across the globe. People of all colors, backgrounds, religions, and cultures with a common goal: to battle inequality through creativity; to promote gender and ethnic diversity through entertainment; and to challenge stereotypical mainstream constructions of race, gender and sexuality. Top Shootout films screen at the Asian American International Film Festival and the Time Warner Theatre in New York City and more. The screenings typically sell out. Production – The Film Lab produces media with positive and prolific perceptions of women and people of color. The TV series, Film Lab Presents, hosted by Jennifer Betit Yen, currently airs on CrossingsTV (Time Warner Cable & Xfinity). We also have an online channel, AAFL TV (http://www.asianamericanfilmlab.com/AAFLTV), to which viewers can subscribe to for free at youtube.com/asamfilmlab. The Film Lab management team consists of Jennifer Betit Yen (President and Board Member, founder of AAFL TV Production Arm), Daryl King (Secretary and Advisory Board Member), Cheryl L. Davis (screenplay and acting workshops coordinator), Kadaja Brown (Communications and Outreach), Georges Bridges (Unfinished Works co-coordinator and Film Lab Productions/AAFL TV), and Ray Lanuza (Unfinished Works co-coordinator and Film Lab Productions/AAFL TV), along with the dedicated Shootout team. Board members include James Kyson and Aaron Woolfolk, among others. For more information, please visit the Film Lab's website at film-lab.org. 9th Season of Film Lab Presents Premieres Tomorrow on CrossingsTV!